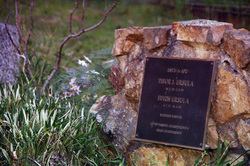 Beenak Cemetery, near Hoddles Creek, is nestled in a picturesque valley amongst virgin bush land and other natural flora and fauna. It holds the key to the lives of the district's early settlers. It was gazetted as a cemetery on 13 December 1878 . Some of the century-old graves were placed in an un-made government road which adjoined the cemetery boundary. The un-made road has since been closed and reserved as part of the cemetery. The records of those early days are sketchy, and the lack of headstones means Trustees are unsure of who are buried in some graves, although all the names are known. The first graves in the road were those of a mother and her newborn baby - both died during childbirth. Two other newborn babies and two adults were buried between 1886 and 1889. Only a timber stake marked the graves. It wasn't until the 1980's, almost a century later, that Beenak Cemetery really began to service the Upper Yarra population, with the burial of two well-known long-time residents in the district beginning a new interest in the tranquil bush cemetery. People have come to realize the cemetery is steeped in the district's heritage and they appreciate its unspoiled surrounds which will never be built out. In keeping with the bush cemetery, most graves have simple markers and timber surrounds. The cemetery survived the great bush fires of 1926 and 1939 when markers were burned and the original picket fence destroyed. Beenak Cemetery will weather many other disasters and continue to record the area's history. Beenak Cemetery was gazetted as a cemetery on 13 December 1878. It comprises 4 acres, 3 roods and 18 perches. It is situated in the township of Beenak, Shire of Upper Yarra and is said to be 24 miles from Lilydale which lies to the North West and about 14 miles from Warburton which lies to the North East. Although this site is said to be at the township of Beenak, there is no township. A site was surveyed for the township but no settlement has ever taken place there and the site remains as virgin forest. The shape of the cemetery site is oblong. Its short side adjoins Beenak Road which is just a bush track cut in the side of the range. This is on the South. On the West it adjoins a surveyed road that divides it from the township reserve. On the North and East sides there is open forest land all unfenced. The nearest watercourse to the site is the McRae Creek which is about 10 chains from its Northern boundary. It is a swiftly running stream with steep banks. From the line of driftwood etc along the banks it would appear to swell during the wet season to a stream some 30 to 40 feet wide in places. This creek flows towards the West and joins the Woori Yallock Creek. The population of the Parish of Beenak is said to be under one hundred within a radius of about three miles from the cemetery site. There are only five families. The local feeling is that there is little probability of any further settlement taking place in this district. The site is spoken of locally as being in the "Beenak Ranges". There is nothing, save the little cluster of graves, to indicate it is a cemetery. The total number of burials that had taken place up till time of inspection on 5 th October 1899 was six - five adults and a newly born baby. On account of the population and also on account of the difficulty in clearing the site, I do not consider it at all suitable. I would also emphasise the fact that although this site has been available for twenty one years, only six burials have taken place and even this small number are uncared for and neglected. At your request I visited the Beenak Public Cemetery on 23 rd March 1965 and interviewed the Trustees Messrs. Hunter, Escourt and Scriven concerning the cemetery affairs. The land was reserved for cemetery purposes in 1878 and Trustees were appointed in 1911. It comprises about 4 acres of land, 1 acre partially fenced, the other 3 acres is unfenced and is forest. The first burial took place in 1886 and between that time and 1942 there were 16 burials. However, there are no monuments and no identification markers to show where the graves are. I was informed the early graves were enclosed with wooden palings but these have since been destroyed by fire. The cemetery area itself is in very poor condition, being overgrown with bracken and scrub. A major cleanup is necessary and finance would be required (£68) as the Trust has no money of its own. I placed before the trust the possibility of the cemetery being closed to further burials and the Council asked to assume trusteeship in an effort to keep the area in reasonable condition. This did not appeal to them as they envisaged that in view of their many years as Trustees they would be permitted to be buried there. Beyond this there is no demand for burial plots as people are content to bury their relatives at the Emerald and Gembrook cemeteries which are apparently well conducted and maintained. I feel sure the Trustees are keen to undertake the task of having the cemetery affairs on a business-like basis and after the initial work of drawing up the plan and clearing the area is accomplished, management will be a great deal easier for all concerned. It is unlikely that any significant number would wish to be buried there and difficulty would be met in obtaining sufficient finance to maintain the area in reasonable condition. Whatever happened to Jim Hunter? Jim was the Post Master at Beenak at the time of the Basans Corner tragedy back in 1951. Jim also employed Pearl Dodds as his house keeper. many of those years as the sole member and also as Chairman. For the reader's background information, the cemetery had its first burials in 1886, they being a Miss Barber and Mrs Ann Sharp. Within the cemetery in graves C16, 17, 18, Jim's Father (1936), Mother (1942) and Brother (1935) are buried. Until recently the two graves of Jim's parents had Egyptian Cypress trees planted at the head and the foot; they were removed due to storm damage. (Note: Egyptian Cypress trees became known as the tree of mourning and were associated with death, eternity and the underworld. In Roman funerals, cypress branches adorned the body while lying in state and were carried by mourners as a sign of grief and respect. To this day when a Pope of the Roman Catholic Church dies, he is buried in a casket made from Cypress Wood). To the best of my knowledge, (and as yet I can't verify), Jim died in approximately 1970-1971. During his time at Beenak I can only assume for many years he would have tended to his family's graves as well as carrying out the administrative duties of a Trust Member. People I have spoken to who knew Jim have told me that although his education was limited, he became an avid reader and was able to talk with great authority on a vast number of subjects he had studied. why was he not buried with his family members? ​and have information that could help to solve the puzzle.